PHUKET: The future of Phuket as a rest and relaxation destination for US Navy ships is in jeopardy following a blockade of the access road at the Phuket Deep Sea Port by taxi drivers demanding sailors use their service instead of a free transport service provided by the US military. Details of what transpired last night have yet to be fully confirmed, but sources told the Gazette this morning that the blockade lasted several hours and was only broken up around midnight following negotiations between the drivers and police, local government and military negotiators. The stranded sailors were aboard the US Navy vessels USS Curts and USS Vandegrift as well as the US Coast Guard Cutter Mellon. The vessels will be in Phuket from June 12 to 20, with a staggered arrival and departure schedule. Top local officials were immediately notified of the blockade, which lasted from about 9pm until midnight. The protesters, which included a number of unregistered ‘black plate’ taxi drivers, set up the blockade when they noticed sailors inside the Deep Sea Port security gate boarding passenger vans bound for Patong. The drivers were apparently angry that the sailors were boarding passenger vans provided for them free of charge by a private firm that has a contract with the US Navy to provide support services for visiting ships. 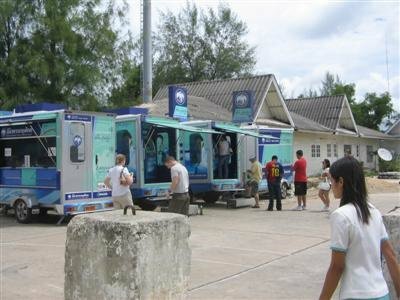 In the past, the sailors were taken to Patong in large air-conditioned coaches. The appearance of the passenger vans in their place infuriated the tuk-tuk drivers, who thought their ‘turf’ was being infringed upon. A false rumor circulated among the taxi drivers that the sailors were paying 200 baht a head to board the vans, which in fact were provided free-of-charge, just as the buses were in the past. Part of the problem may have arisen because the new port manager had failed to notify the tuk-tuk drivers in advance of the change, the source said. A source in the Royal Thai Navy responsible for security at Phuket Deep Sea Port had a somewhat different version of events. He told the Gazette under condition of anonymity that as many as 500 tuk-tuks, ‘black plate’ taxis and vans, all desperate for low-season fares, converged at the Deep Sea Port at the same time to try and collect passengers numbering only about 300. The blockade was more of a traffic jam than an organized blockade, he said. Preechavude ‘Prab’ Keesin, president of the newly formed Patong Taxi Federation (PTF), said that members of his association were not among the drivers involved in the alleged protest. “Our members wouldn’t do such a thing,” he said. A source in the Phuket Provincial Administration Organization confirmed that ‘local taxi drivers’ did in fact blockade the access road until about midnight, at which time the dispute was settled by negotiation. Chairat Khumban, secretary of Wichit Mayor Kreetar Saetan, said the blockade was ended after the drivers agreed with military, police and Wichit Municipality negotiators to go back to an old agreement allowing the local taxis access to low-ranking US military personnel while only officers could take advantage of the free van service provided by an outside contractor. A high-ranking US Navy officer attending a welcome dinner put on by the Phuket branch of the US Navy League in Patong last night was reportedly furious at the security breach when informed by telephone. His crew had been on active duty in the Persian Gulf and hadn’t been ashore for 97 days, he said. The Phuket visit was a last-minute change from the originally scheduled visit to Singapore. “We would obviously never have a problem like this in Singapore,” the officer was quoted as saying. Phuket City Police this morning said the duty officer at the time did not visit the protest site and that no criminal charges have been filed in connection with the incident. A source told the Gazette the incident could place Phuket’s role as an R&R and resupply site for the US military in serious jeopardy and that it would probably take a few weeks to find out the true damage of the incident. The blockade could be taken as a major security breach because the drivers were allowed to block US military personnel at their designated point of entry into the country and inside the established security perimeter, he said. Resupply of American warships, including some of the world’s largest aircraft carriers, is an important industry for Phuket. “People think the only benefit to the local economy is the money sailors spend on night-life, but that is only the tip of the iceberg. When the USS Ronald Reagan was here they loaded 14 containers of supplies. It is a huge business and it would be a shame if we were to lose it because of the greed of a small group of taxi drivers,” he said.